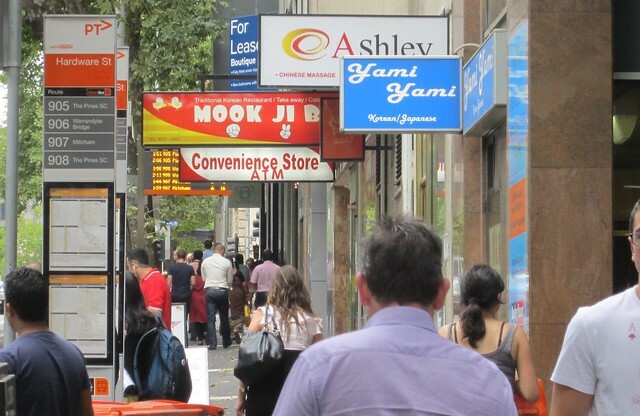 Smartbus signs – wouldn’t it be good if you could see them from the bus stop? Having spent all that money on GPS in the buses, transmitters and receivers to get the bus locations onto electronic signs, wouldn’t you think they’d think carefully about where those signs were located? To be fair, most of those I’ve spotted are quite well located, so they are visible from the bus stops they serve. But are there others like these ones? Passengers do like having realtime information, and along with the increased frequencies and (limited, some would argue) traffic priority measures, it’s led to strong patronage growth on Smartbuses… but they can do better. 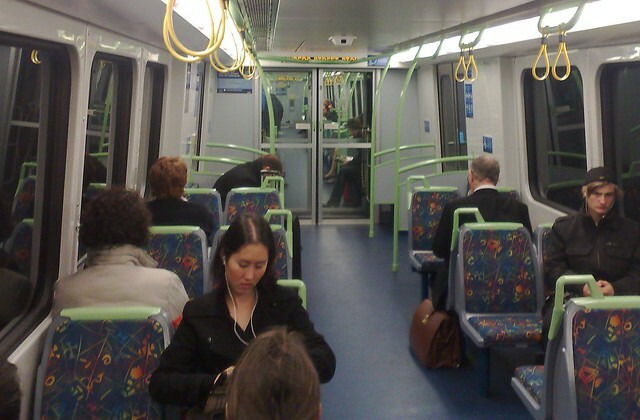 Meanwhile on the new X’Trapolis trains, the signs inside the carriage are neatly obscured by the cross-bars in the doorways, which are designed to be at a good height to hold onto, without people banging their heads on them. ← Previous Previous post: Motorcycle/scooter parking on footpaths – In a crowded city centre, this doesn’t make sense. On a wider issue, are the expected times displayed on the bus stop signs accurate? I seldom use buses so don’t know. Roger, the countdown is very true. works on GPS based on where the bus is really located. You can always trust the one minute, as it flashes, does mean the bus is about to arrive. You can see, by the website I have stated in my form here, I have a passion for the SmartBus and the PIDS they have. I do use the Dandenong one often, and yes you need to be directly under it if you want to read it. They have train PIDS in the bus area, so perhaps they should have a bus PIDS in the train area, say in the upper level. So, I can be forewarned of a due bus. 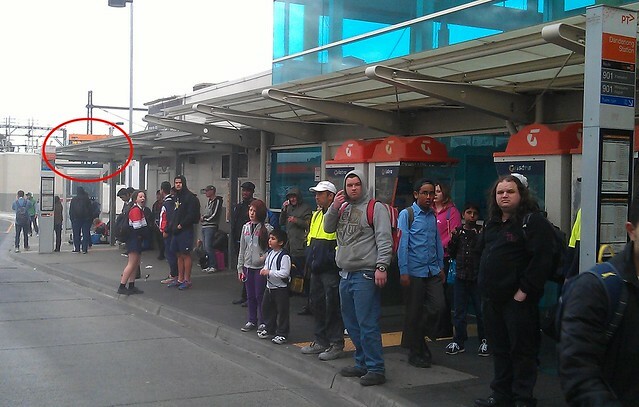 As for visibility of the one at Dandenong, I would value having the bus area put under cover totally. that would remove the obstruction too. Last night I headed to the city again and I just missed the 5:57 train from Oakleigh. 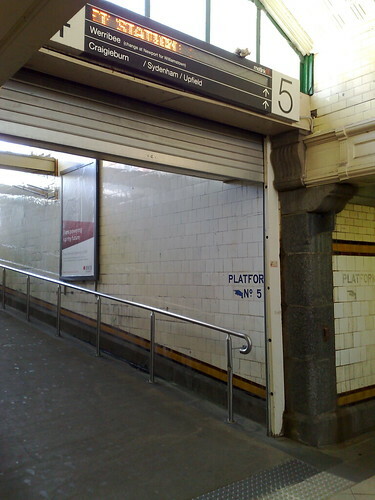 The next train was supposed to be the 6:08, but about 5 minutes before it was due, the “due in … minutes” part of the sign blanked out (both above the booking office and on the sign on the platform itself) so we had no idea if it would be on time or not. It was actually a few minutes late, but it pulled in just as I was asking the ticketing officer about it. I don’t have a photo, but the smart bus sign at Chadstone Shopping Center is almost completely obscured by a roof on one side. I always look at it and wonder which one was there first. Sometimes perfectly visible signs could be better placed. The bus routes leaving from the east side of Essendon station aren’t quite visible from the platform, so you don’t know if it’s worth going for one bus, another on the west (bus is visible from the platform, no PIDS) or walking. PID boad at bentleigh station has been broken for so long. needs fixing and never gives real time information, and train list isn’t there. BTW how doset smartbus 703 meet smartbus guidelines? also can i ask this? i have a student yearly ticket. because a fare cant be taken off (flat fee ticket) do i need to touch off? In London and Japan a lot of effort, experience and expertise is put into signage on their transport systems. Apparently not so much here. Wasn’t PTV supposed to be making an app for this? I like the way there is no indication of any of the train timings anywhere near the northern entrance of Flagstaff station. @Josh – I’d argue that the bigger problem there is that there are buses that presumably run either similar routes, or to the same trip generators running from different stops. I used to have the same problem when I lived in Maribyrnong and often caught buses from Footscray Station. There were two different buses I could take, both going from Footscray Station to Highpoint, yet they left from about 300m apart, around a bloody corner! I frequently missed one checking the other. The worst thing about catching a bus is having to look at oncoming traffic for 10-30 mins to see if the bus is coming. The App should tell us how many metres away the bus or tram is. I have a brain, I can work out that if it is 2km away, I dont need to look at oncoming traffic.